In February, we attended the March for Real Climate Leadership in Oakland, CA. It was an honor to join the beautiful, diverse, committed crowd of 8,000 people who oppose fracking and who are willing to stand up for the health of humans and the planet we live on. 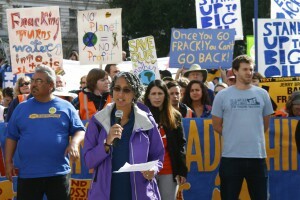 The message to Governor Jerry Brown was loud & clear: we want a ban on fracking NOW. Our Program Manager, Sahru Keiser, delivered the following message at the press conference before the march kicked off. Sahru speaking before the march began. Governor Brown, fracking is bad for our climate and it’s bad for our health. New York and Vermont have both banned fracking. Now, Scotland and Wales have taken steps to block this toxic practice. It’s time for California to step up and be a leader. The science is clear. 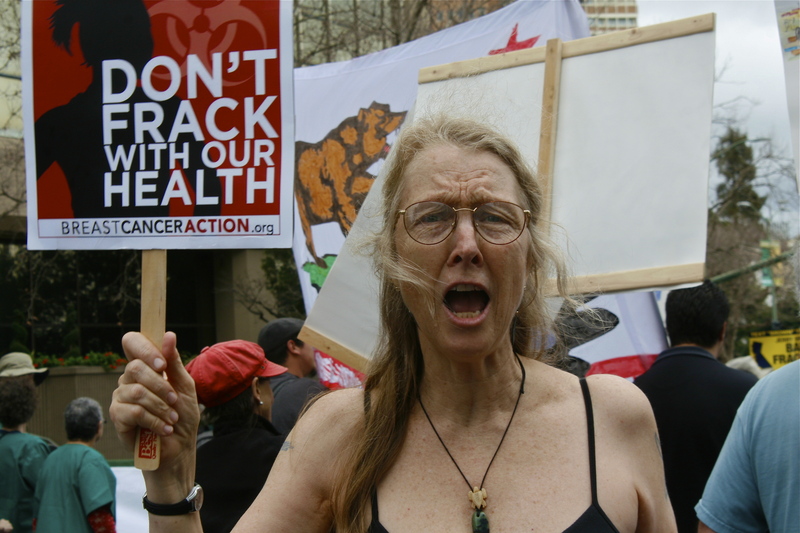 One of the most important and growing pathways of exposure to cancer-linked chemicals that endangers out health and increases our risk of breast cancer is fracking. Thanks to the compendium released by Concerned Health Professionals of New York, the human health impacts of fracking are clearly devastating. More than 700 chemicals are used in fracking: carcinogens, plastics, neurotoxins, hormone disruptors, heavy metals and radioactive agents. And 25% of these chemicals are linked to cancer, including breast cancer specifically. More than 15 million people live within a mile of a fracking well drilled since 2000. And we know that 50% of wells leak after 15 years. These toxins contaminate our basic necessities of life: our food, water and air. Fracking produces a toxic and radioactive legacy that threatens our health for years to come. Breast Cancer Action was founded 25 years ago by women who demanded more attention be paid to breast cancer prevention. We must stop this toxic process because our lives and the lives of future generations may depend on it. Governor Brown, we’re calling on you to follow the science and stop fracking with our health!